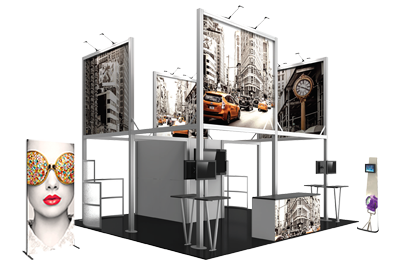 Hybrid Pro™ Modular Kit 30 is a modern, sleek modular exhibit that will create a WOW-inducing impresion in your next tradeshow. Kit 30 features three push-fit fabric backwalls. The center wall includes a monitor mount that can hold a medium monitor; the sidewalls feature three black shelves to display small products. The canopies above include puck lights designed to shine light on products below.